On Christmas Eve, St Columba’s Church was full downstairs, with more people in the gallery for the candlelit service of carols and readings, led by our Pastoral Friend, Revd Gordon Connacher. 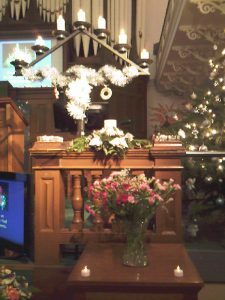 There were many excited children in the congregation, looking forward to Christmas. 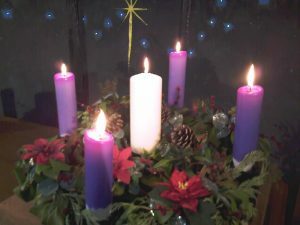 Highlights of the service included organ and keyboard duets, a clarinet solo of When a Child is Born, and the final carol, Silent Night, during which lights were dimmed so that we were lit only by the many candles around the church. Gordon reminded us that at the first Christmas, God himself had come to earth in human form, and spoken in words we could understand. 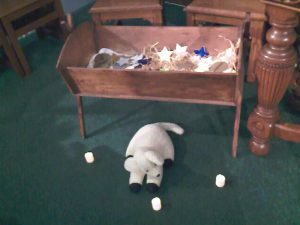 A shorter and smaller all-age service on Christmas morning sparked emotional memories of a trip to the Church of the Nativity in Bethlehem and a happy reunion with good friends. We were encouraged to share the love of God with the world around us in the coming year. 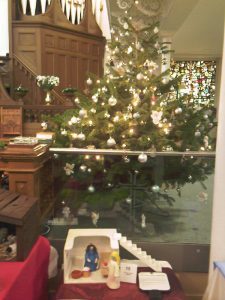 The famous knitted Bible, made by members of St George’s United Reformed Church, Hartlepool, has travelled all over the country since it first came to North Shields in 2014, before returning for a 4-day stay at St Columba’s for the Christmas Market weekend. 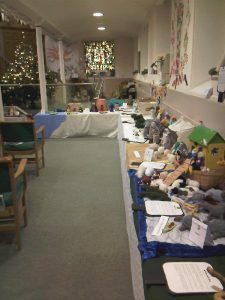 The display features 34 scenes from Bible stories from creation to the post-resurrection breakfast on the beach. Each character and object is lovingly and individually crafted – even the little fish in the net. 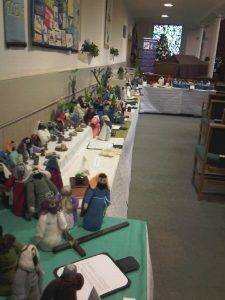 The full story of the knitted Bible is told by St George’s themselves at http://www.stgeorgesurc.co.uk/the-knitted-bible/. Many visitors to the church this weekend have enjoyed seeing the exhibition, which included a treasure hunt and pictures to colour in for children. 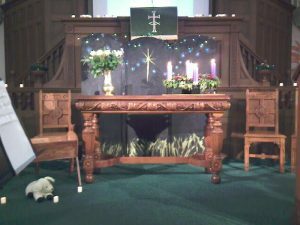 In our morning service on Sunday 11 December, we were reminded that Advent is a time of preparation in three different ways – for the celebration of Christ’s birth, for the future coming of Christ’s kingdom, and for Christ’s leading in our daily lives. Angela, who led our service, recited John Betjeman’s poem Advent 1955 entirely from memory, to illustrate her theme. We were encouraged to use well the timing of waiting. 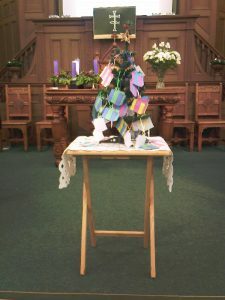 In our prayers, we hung presents on the small tree to represent our thanks for God’s blessings. At our morning service on Sunday 13 November, we remembered those who had been killed in war in two minutes’ silence at 11.00. 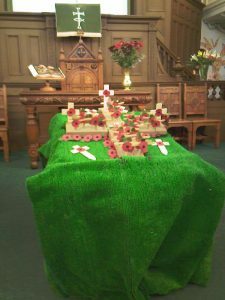 As the names of church members killed in the First and Second World Wars were read out, poppies were placed in the shape of a cross. 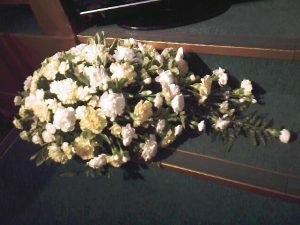 We were also sad to hear of the sudden death of one of our former ministers, Revd Alan Spivey. A worship team led our harvest festival this year. 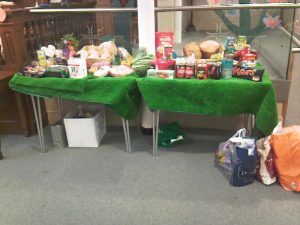 We heard about the good work done by the 14 volunteers at Nite Bite, which provides food and company once a week for about 30 people, mainly men. 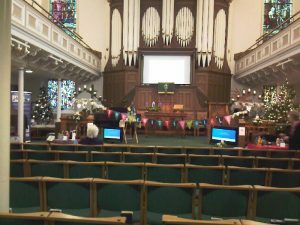 Churches Together in North Shields supports their work with those who are homeless or in need. Nite Bite has been going for 18 years. We reflected on God’s goodness to us, and our need to acknowledge that and to share where we can. One sketch showed us some of the people involved in growing corn to make bread for our breakfast, and another sketch poked fun at the extravagant range of choices available to consumers with money. Jesus’ parable of the rich fool (told in Luke 12: 13-21) was acted out for us with a puppet and ever more elaborate props! We also reflected on stories of three Biblical gardens. 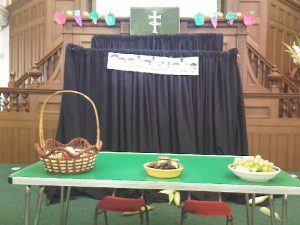 In Eden, represented by a basket of apples, God showed his love for us by giving us choice. In Gethsemane, represented by a basket of olives, Jesus felt crushed by the consequences of our bad choices. In Jesus’ parable of the vine, represented by a bowl of grapes, we may be cured and enabled to bear spiritual fruits for God.